The German elections are over, and for a brief moment, it looks like all is stable. But make no mistake, this is only the eye of the storm. I have full confidence that Germany has already shifted away from the current leadership. 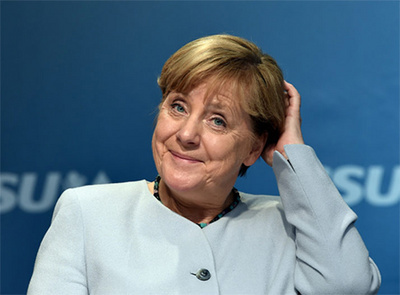 In a significant rejection of personal responsibility, Dr. Merkel, the chancellor states that she has done nothing wrong. But many things haven’t gone right either. Society and its problematics around the world have moved on, circumventing traditional politics and politicians. From a long term analytical business perspective, politics requires a new direction. The power parties may elegantly gloss over losing ten percentage points. They talk about how the voters have made a mistake, how one will undermine the competition, how all it takes are better explanations, and how all these inequities will be rectified shortly. How wrong they are! Perceptions change. Research by Mintel reports that many consumers now judge soap bars to be a haven for bacteria. Our work, which systematically tracks business behavior and expectations over the past 30 years, indicates new core values. Traditional dimensions of politics and individuals have four key dimensions – the four legs of the director’s stool. First is ‘competition’ which determines the approach to progress – one party achieves ‘the winner takes all’, others meekly fall in line for the droppings from the table. Second is the establishment and management of ‘risk’ where steely nerves and occasional disasters determine lifestyle. Then comes ‘profit’ which accounts for success in tangible form. Finally, the fourth leg of the stool is ‘property rights’, which assure innovators of their return on investments. There now is a simultaneous splintering of all four legs which inhibits successful conduct of direction. The new chair has a new set of four legs which are crucial in understanding society. First is ‘truthfulness’. Firms and voters detest fake news, insincere excuses and unreflected comments. When the shadows of unreality obscure one’s outlook, exposed people extract a penalty. Second is ‘simplicity’. Employees and citizens want to understand how things and relationships work and interact. . Without that, it is hard to provide or accept truthfulness. Then there is ‘participation’, permitting insight beyond simple observation and offering an active role in shaping the conditions which confront one’s life. The fourth leg is ‘responsibility’ – going far beyond customary short memories and the traditional pleading of ignorance. The new drive says: we are here and, if not, we are coming. Just as in America, European voters are beginning to be energized by the new director’s chair and its new criteria. They expect new directions and negate tradition. Judging by shifts in Britain and Spain, stability in Germany may not be that frequent, that assured and that necessary anymore. It’s also not just the money or even economic growth that matter most. Known quantity may give way to even more quality and a rise of local criteria. “Merkeltinism” will be substituted by Mercantilism. German economic power may be repulsed by regions seeking to regain their cultural self-determination. The U.S. emphasis on re-shoring, enhancing and encouraging of local production is likely a portent of the new Europe, which perhaps reduces Germany from the Export King to a mere Prince. More export supporting banks will permeate Europe, accompanied by increases in protectionism. There are still many options for tariff and non-tariff barriers. Within, but particularly outside of the EU one can expect growing restrictions in both capital and labor flows and a rise of sanctions. Vested interests will become more visible, and provide new decision frameworks. All that requires a new team. Low profile politicians will inexorably move onto the new pedestal. Andreas Pinkwart (FDP) and Karl-Theodor zu Guttenberg (CSU/CSIS) are two who get it. Robert Zimmerman (Bob Dylan) may have written the song half a century ago, but now more than ever we get key guidance from “the times they are a changing”. The change is with us already – the new director’s chair will give us new rules of success and new directors.